This is a great rocking and rolling show for amateur theatres as your cast can be as large or small as you like. Choose your own songs to suit your cast. Only a very simple set is required with a backdrop to represent a radio, a sound effects booth on one side and a producer's booth on the other. A rostrum for the singers with some steps upstage would allow different heights for interest. Prop microphones may be used and moved on and off by cast members. Gary Gusher's mic to stay in place. The newsreader's desk may be moved on and off by newsreaders. This show will have everyone putting their glad rags on and joining you for the time of their lives! Yes, it's time to dust off the petticoats and stove-pipes, and shimmy back to the 50s with the gang from Radio (insert your theatre here)!! Audiences will be dazzled by the charm, wit and general whiteness of Announcer Gary Gusher's teeth as he weaves together a fabulous night's entertainment. They'll simply thrill at The Radioettes as they sing and twirl their way through jingles and musical interludes. The indomitable Miss Kitty with her infinite knowledge about love, marriage and 'personal satisfaction' will hit all the right spots too. Hilarious cleaning ladies Beryl and Ida have a lot to say from behind their mops, and earnest new sound effects guy Billy is ready to captivate with his large range of 'entertaining' props. Then there is always luscious co-host Serena with her impressive set of 38s, and dusty farmer Derek Selby's 'Rural Roundup' where his knowledge of all things feral is sure to surprise. All this, plus a highly strung Producer, fabulous toe-tapping numbers and some priceless radio serials. 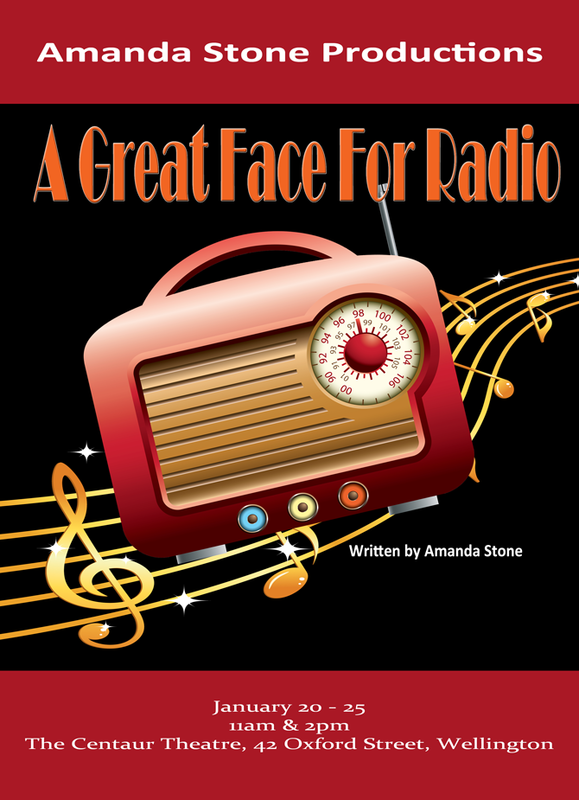 Get ready for one rock n' rollicking escapade after another with A Great Face for Radio! Producer - Intimidated by of GG. Gets flustered. Fluffs around. Billy - Gawky, enthusiastic, bumbling. When he reads the part of Alfred in "The Southlanders" he gets carried away with enthusiasm. Billy should have a xylophone and ding it often, at inappropriate moments, much to Gary Gushers annoyance. He should ham it up as much as possible. During the songs he can pop on different hats or props to suit the song and bop along. Beryl and Ida - dowdy, scarf around head in Hilda Ogden style. Beryl is a bit more downtrodden than Ida. Always has trouble with her husband Cyril. Miss Kitty - Strong personality, bossy, imperious, doesn't take any nonsense. Should read her "Being a Good Wife" segments very strongly, as though her word is law. Radioettes - A trio with matching outfits and wigs. One is having a fling with Gary Gusher. Can double up as backing singers for lead singers. Derek Selby - Slow talking farmer, wears a tweed jacket and gumboots. Serena - Must be excellent at adlibbing, attractive, flirty with audience.